ST. GEORGE – The Red Storm is dead. The Trailblazers have arrived. The Trailblazers were one of three finalists presented to small focus groups after the original six options were whittled down though an online survey held in December. The other potential identities were the Raptors and Sun Warriors. The Trailblazers identity is a nod to the pioneer history of the region and appropriate since the university’s campus is built around the Encampment Mall, the original site where the Mormon pioneers arrived in what would eventually become St. George, Sharp said. Education was also very important to the earlier settlers. Students themselves are also seen as trailblazers as they seek to carve out their potential future paths through their educational pursuits at Dixie State. The new mascot for the institution is a bison, specifically, “Brooks the Bison.” The bison are trailblazers of their own, Sharp said, noting that early settlers followed paths blazed by the roaming buffalo herds across North America. The bison is also seen as a strong figure in relation to athletic pursuits. 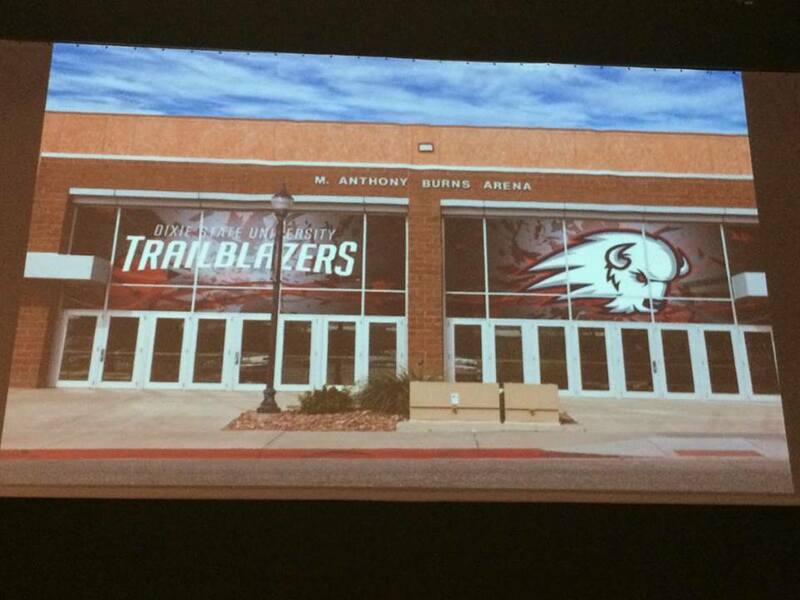 The combination of the Trailblazers and the bison is unique to Dixie State as well, Sharp said. No other collegiate institution has that combination of name and mascot. The new athletic logo for the school is a bison head with the iconic “D” set in the background. The new logo and associated imagery will replace the school’s current sports-related iconography. The school colors primarily remain the same, with red predominant with patches of blue, white and gray also displayed. “Brooks,” the name of the mascot, is another tie to the community’s history, Sharp said. Brooks is named for Samuel Brooks, who was so excited to attend the newly built St. George Stake Academy in 1911 that he slept on the steps of the school the night before it opened, Sharp said. Bringing together a sense of strength and history, as well as the school’s academic side, the bison is seen as a perfect fit for the mascot. “It’s a great symbol of everything we’re going for,” Sharp added. The quest to change Dixie State’s athletic identity and mascot began in November 2014 when the student body president initiated a survey concerning the matter. Around 68 percent of the respondents at the time weren’t happy with the Red Storm identity. The results of the survey were taken to the university’s administration and a green light was given to start the search for a new identity. This happened to coincide quite nicely with elements of the school’s strategic five-year plan to establish a new identity for itself. The school created an identity committee representing DSU’s alumni, students, athletes, faculty, staff, administration and community. Love Communication, a Salt Lake City-based marketing firm, was eventually brought on to assist in the school’s rebranding efforts. Love Communications held focus groups comprised of students, alumni, community leaders, members of the public and others that helped narrow the field of potential identities. The agency created logos for each candidate identity, including the final version of the Trailblazer logo. Data used for the process was also taken from studies conducted over the last decade related to Dixie State’s name and identity. “We weren’t starting from scratch,” Sharp said. As the process continued, 5,000 people responded to a December 2015 survey that originally had six identities to choose from. That was whittled down to three choices – the Trailblazers, Raptors, and Sun Warriors – which led to a new round of smaller focus groups, ultimately leaning in favor of the Trailblazers. “Since then, we’ve just been preparing,” Sharp said. Individuals involved in rolling out the new identity were sworn to secrecy until it was presented to the public Monday afternoon at the M.K. Cox Performing Arts Center on campus. As a part of the rollout, 15,000 elementary school children in the Washington County School District will be given booklets featuring “Brooks the Bison.” Within the booklet, Brooks tells the story of Dixie State’s new identity. The booklet will also be sent out to the public in general through area news media via print and electronic format. 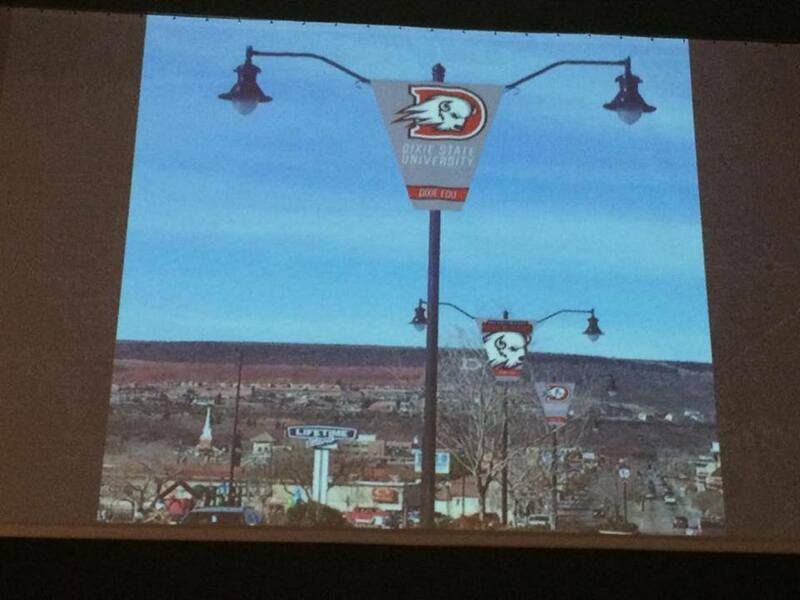 Banners displaying the new logo and identity will hang from light posts on St. George Boulevard between 700 East and 1000 East. Plans to paint a giant logo in the middle of the intersection of 700 East and 100 South are also in the works. While the new mascot will now be known, the costumed version won’t be available until the fall, Sharp said. Those who knew about the new identity and mascot before its unveiling were excited, Sharp said. Still, he understands identity in general has a strong meaning for a lot of people. Many alumni will forever considers themselves Rebels, and they should, he said. “No other collegiate institution has that combination of name and mascot.” There’s a reason for that. As for ‘Brooks The Bison’, did Samuel Brooks ride a bison to the steps of the Administration Building to enroll and then play in the school’s first pickup basketball game? I’ll sleep better tonight knowing the Trailblazers are in town. I don’t like it. They could have done a lot better. Maybe it’ll be changed in another 5 years. Were bison native to the St. George area? Trailblazers will remind non-Utans of Portland. Bisons will remind non-Utans of cool weather. Dixie reminds non-Utans of confederacy/racism. Don’t print up too many tee shirts. An important part in the article was left. How was this project funded? I’m sure Love Communication did not donate their time and resources to DSU. And where are the funds coming from to pay for 15,000 booklets? They made quite a leap going from buffalo to pioneers of southern Utah. I don’t recall any buffalo in southern utah history. If they want to be trailblazers, an ox would be better. But they never gave any options that way, just a package deal. It won’t be long until another polically correct issue will disrupt the peace at Dixie. Boy, they really had to make a stretch to come up with a buffalo for a mascot. So just because the “trailblazer” pioneers walked through areas where there were buffaloes, that’s justification for aligning our southern Utah area with that animal? Goodness. And these people are leading our youth? Someone, somebody at DSU or Love Communication, just had to be “blazed” to come up with Trailblazers. On another note….bison meat is leaner and healthier for you than beef. Try a bison burger. Now there is an idea for the concession vendor at the DSU….Brooks bison burgers! I’m tired of all this political correctness garbage…. GO DIXIE REBELS ! Maybe when “Blazing” you have visions of the The Abominable Albino Tatanka Spirit? Or was it just sun-bleached, either way creepy.